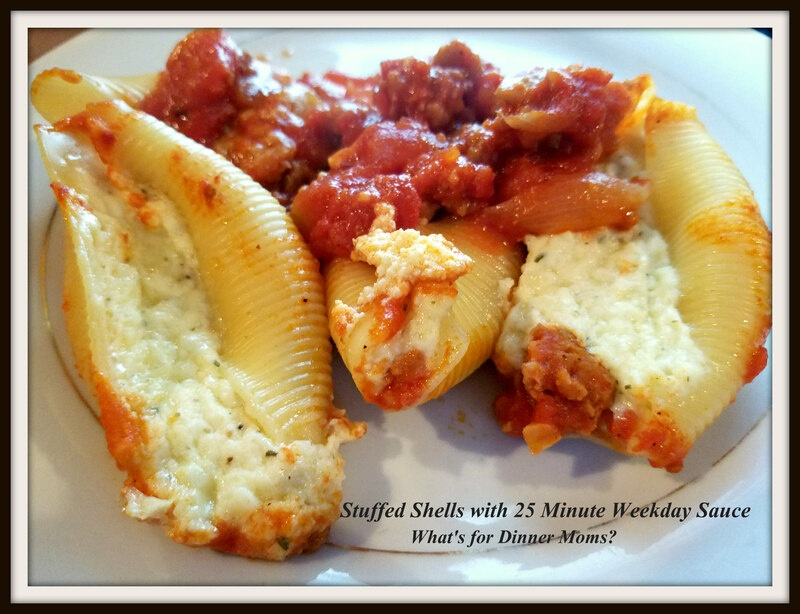 Stuffed Shells with 25 Minute Weekday Sauce – What's for Dinner Moms? Now, I am going to say this is not your grandmother’s sauce that simmers all day on Sunday for family dinner. This is a simple sauce that you can make during the week if you have a bit of extra time. You can let it simmer longer if you like because the flavors will meld more and the sauce will thicken but if you don’t have the time a good 20 minute simmer will be just fine. I made this the other night because I had a package of Italian Sausage that my daughter pulled out of the freezer so I decided to make a meat sauce. You can add meat (Italian Sausage or Ground Beef) or have it plain. This was the super creamy and yummy comfort food meal we all needed. Snow on the ground and half way through our school vacation we all wanted comfort food and this was perfect. Tip: This recipe made enough for a 13 x 9 pan and an 8×8 pan. So plan on having leftovers for lunch or cut back on the amount of pasta you make. My shells were about 3″ in length so they were fairly large. Begin pasta sauce by placing a large pot over medium heat. Add olive oil and onions to pan. Cook onions to softened about 5-8 minutes. Add garlic to pan and heat for about 1-2 minutes until well fragrant. Add meat if desired and cook through. Remove any extra grease from the pan. Add tomatoes and tomato paste to pan and stir well. Allow to simmer for at least 20 minutes until flavors have blended together. While the sauce is simmering put your shells on to boil according to package directions. Drain and separate them so you can stuff them. Make shell filling by mixing all ingredients until well blended in a bowl. When shells have cooled enough to handle stuff each with a heaping tablespoon or two of filling. You want them a bit overfilled. Place filled shells in a 13 x 9 casserole dish that has been sprayed with non-stick spray. Drizzle a cup or so of sauce over the shells. You want the shells to have a bit of sauce around them to not dry out as they bake. Cover with aluminum foil and bake for 30 minutes or until the shells in the center are hot in the center. Remove pan from oven and serve with extra sauce drizzled over the top if desired. Sounds similar to my Italian pasta sauce I make. Delicious. Simple can be very tasty and fulfilling. Thanks for all you share, Marci! Thank you for your sweet words, Sylvester! Yumm-this might just be my dinner tonight! It was exactly what we needed the other night for comfort food. Hope you like it! Love this. I once made something similar, but I never though to use ricotta cheese. After reading this, I just realized that I have some Italian sausage in my freezer. Thank you. A timely post. I bought the Italian Family Over For Sunday Dinner Size container of ricotta cheese the other day. I have the shells and Italian sausage on hand, Thanks for the recipe. Sunday Dinner, I think. Small Non-Italian Family, though. That’s the perfect recipe for me. Easy to handle, quickly done, and I can even prepare it in advance! Again… I am printing it right away!! Hi Marci! I just finally made this dish. #2 son is coming tonight and I fixed it for him. I noticed in the recipe that there was no temperature indicated at which to bake the filled shells, so I guessed 350°. Thank You! So sorry. Yes, I will fix that now. Thanks again. Very well received. We all had a lovely dinner. I could say so much about my Asperger’s Syndrome son, now an adult. I just forget the diagnosis and enjoy being with him. So glad you had a great meal together. My son and I had an interesting discussion about struggles. We all have them, some are just more out front. Not better or worse. Yum! I love an easy recipe with a spectacular outcome!! !